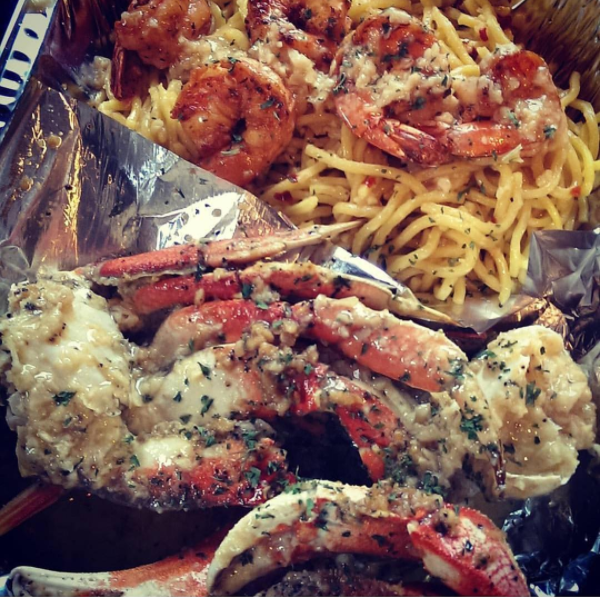 Available Friday nights at Complex Oakland: Dungeness crab, blackened shrimp, and garlic noodles. Oscar Edwards saw all of the shiny new high-rise apartment buildings planned for Downtown Oakland and figured the writing was on the wall: There probably wasn’t much of a future in running a nightclub in that neighborhood. So, Edwards, who owns the three-story downtown Oakland entertainment complex formerly known as Venue, shut down Vinyl, the nightclub on the second floor, and is redoubling his efforts to establish the facility — now called Complex Oakland (420 14th St.) — as a destination for live shows by national hip-hop and rock acts. He’s also putting a renewed focus on something else that he knows people in Oakland care about: food and drink. The last time What the Fork checked in with Edwards, he had just launched a pop-up restaurant space (Crate) on the first floor of the building. Last summer, he moved the restaurant up to the second floor, where it essentially replaced the nightclub. Pop-up chefs rotated frequently during restaurant’s early days, but right now, the only regular guest is Smelly’s Authentic Creole and Soul Food, which pops up every Friday night with a menu heavy on things like Dungeness crab, blackened prawns, garlic noodles, and “Surf & Turf Fries.” Edwards said he’s now working to fill in the other days of the week — especially the weekday lunch slots — with food truck operators and other aspiring food entrepreneurs who want to work out of a brick-and-mortar space a few times a month. Meanwhile, the first floor of Complex is in the process of being turned into a coffee shop called Feral, which will be run by the folks behind the Grand Avenue coffee shop Perch. Edwards expects Feral to be ready to open by April 15.